All transactions are safe and secure with a reliable history in online purchasing behind each of our associates. Buy the Good Luck Bear Costume t-shirt to own Care Bears clothing and merchandise. 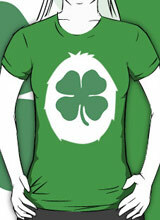 This green Good Luck Bear t-shirt reveals that the friendly creature wearing this costume design is a Lucky Bear. As if the four leaf clover on his tummy isn't enough, your friends will want to rub your tummy for even more luck. Be sure to cuddle with a plush version of this cute bear to become an inseparable pair. If you come to realize that bears are flesh eaters, then perhaps a Zombie Bear t-shirt might be a better fit. Pair this with a Cheer or Good Luck Bear plush from below. The stuffed animals are the perfect match for this lucky Care Bears t-shirt. Also, don't miss Care Bear action figures. In addition to the Good Luck Bear Costume tee above, browse the Care Bears Clothing Gallery for more apparel like men's and women's clothes, kids shirts or hoodies.